We've found that keeping your main school website minimal with an overview of content for the community, tied with Events, Key Dates and Daily Notices pulled directly from KAMAR and easy ways for visitors to contact you. That still leaves you with a large amount of detailed content that still needs to be accessible by your Staff, PTA, Board of Trustees ERO or other groups. This is where the Inbox Design Knowledgebase platform will fit in. Your knowledgebase extension takes the key features of Moodle and Ultranet, plus our integration with KAMAR to allow you to build your schools secure resource centre. 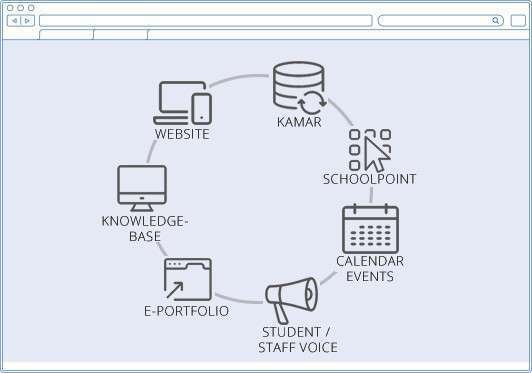 User accounts merge with KAMAR for one-log-on access to content that is relevant to each user level and allow for seamless logins to the Parent Portal and SchoolPoint (Our Online Course Selection Software). Staff can also manage their personal section to upload and store PLD documents and reporting tools. Health & Safety is a fundamental requirement in your School; this platform also allows your SLT to generate, assign and report on Scheduled Health and Safety reviews and Incidents by each Department. Ultranet would cost your School about $12,000.00+GST each year, and Moodle would cost around $8000.00+GST each year not including setup. Inbox Design are offering this extension to your website at $200+GST per Month. We aim to continuously develop this with only features New Zealand Schools need. Setup content for public viewing. Limit access to Staff, Departments, Students, by year level or the caregiver of students by the same grouping. Lists are build and actively linked directly with your KAMAR for up-to-date staff and student lists. Push into Mailchimp for notification of new content or content assignments. Create groups and users that don't need access to KAMAR like your PTA or Board of Trustees members and let them manage their own content. RESTFul API Access to Content. Manage the complete process of EOTC, PD (Profesional Development/Learning) or Leave requests, - or any type of staff request. Follow an online approval process with multi-stage sign off, request additional information and identify any risk assessment requirements for all categories of requests. Follow defined criteria and providing a full audit trail of requests, approval and declines with reason’s given. Requests and history are tied to your KAMAR data so staff, student and caregiver details are easily linked when entering requests and RAMS forms (which can be imported from our growing library of templates). There is a minimum amount of setup and comprehensive reporting tools so you can be up and running in minutes. Health & Safety can be an arduous task, with the Knowledgebase H&S module your Safety Officer can assign scheduled recurring safety audits for Heads to Departments with time-based email/SMS reminders and a Traffic-light status symbol to ensure each Department has checked and completed each section applicable to them. Incident reports can be created and tagged to Staff, Students and Departments to identify safety issues within your school, recurring problems or schedule maintenance. Our Incident reporting tool allows staff members to quickly and easily log any incident, accident or injury, attaching Student information, other attending staff members and record details relevant to that incident. All reportable on to identify where issues are happening and eliminating them! Staff will have their own set of content pages where they can set reminders, write notes and upload and group documents.